What is Fabuloso Pro, Who Needs It, What Makes it Special: Evo Fabuloso Pro Product Review & FABULOSO DISCOUNT! The stylists at Crimson Hair Studio are hair color experts and even your most natural tones and are applied with painterly technique and talent and every shade treated as fashion hair art. With so many color products, dye trends, and fashion colors running amok, we wanted to paint a picture to display one of our favorite ways to attain color and keep it bright and fresh. What is Evo Fabuloso Pro, Who Needs It, What Makes it Special, Why Fabuloso? Fabuloso Pro is perfect for anyone wanting to refresh salon color at home. Fabuloso is a color conditioner that is custom blended by your stylist, so whether you want to tone your blonde, enhance your red, neutralize your brown, or add pink, purple, teal, or blue the options are endless. And unlike other hair colors that fade over time, with your take home conditioner your color will stay looking fab until your next visit! 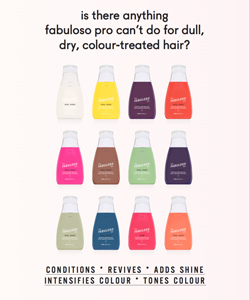 Francesca: Fabuloso is a gift from the color gods: everyone wishes their hair color lasted a little longer when they achieve the perfect shade; that’s the beauty of Fabuloso. I use it most to tone and to refresh color. It’s soft, conditioning, satisfying. The best part is the ability to take the treatment home and not pay for a color treatment every time your look needs refreshing. Becky: My favorite people to recommend Fabuloso to are those who are looking to maintain vibrancy. Ranging from redheads to party colors, the at home treatment helps preserve tones until the client’s next visit. When using it in these cases, it can be used in place of regular conditioner each time shampooing. Sarah: I personally LOVE Fabuloso. When I was an ashy double process it was a must for keeping my hair looking fresh and not brassy. I’m lucky to have light hair, so I also use it to mix up the tone constantly. It truly does wash out in a way no other fashion color does. Em: Fabuloso Pro is a conditioner-based direct pigment that is nourishing for the hair. It is a semi-permanent color and perfect for blondes who want a temporary fashion color, want to change the tone of their blonde, and can be used as the toner gloss for all hair colors across the board (red heads, brunettes, etc). While it is a perfect option for those who need a conditioner treatment and low committal color, it is very temporary and will wash out completely in 3-12 washes. Jeanne: I love using Fabuloso in the salon as a toner because it really brightens things up. The platinum is one of my favorite shades because most of my blondes like to be lighter and brighter and with platinum Fabuloso I can knock the gold tones out before I tone for a nice, even, bright blonde. The custom blended conditioners are great to send my clients home with, especially the gals and guys who want the bright fashion colors but don’t want the commitment of coming to the salon every few weeks to refresh, the refreshing can happen right in your own bathroom. Overall FabPro is a very unique and fun product, and can be used by any client who wants to keep their color fresh and fun in between hair color services. Evo FabulosoPro is a custom blended, color enhancing conditioner that provides instant, intensifying color combined with a nourishing take-home treatment to condition, repair, tone & add shine!